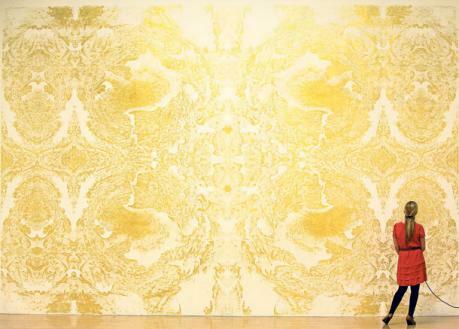 The 2009 Turner Prize winner Richard Wright produced a beautiful highly detailed painting in gold leaf large enough to fill one of the gallery's walls. It attracted huge viewing figures with massive queues waiting to view it at the time. "It heralds nothing less than the return of beauty to modern art." Times are tough at the moment and people need something beautiful in their lives. This is something i would certainly like to display in my work.